"I thought this race would be a disaster. Because I thought you'd be too sensible to come. I see you acting with a good heart. Acting out of love, doing good things for no reason. You know who does things for no good reason? MAS LOCOS. You never know if we'll get a chance like this again." "Tomorrow will be one of the greates races of all time. And, you know who is going to see it? Only Crazy People. Only you, Mas Locos!" The theme of this year's race, is a harmonious collaboration of all cultures. "SOMOS MAS LOCOS" - "WE ARE MAS LOCOS"! As similar with the Raramuri Greeting, "Kuira Ba" - We are One! Yes, all of us are MAS LOCOS! Our beautiful poster honors the talents of Chihuahua's Graphics Artist, Jairo Alberto Ortiz Valle, inspired (and with permission) by the original design of Micah True's friend, Boulder, Colorado Artist Clyde Isaacs. 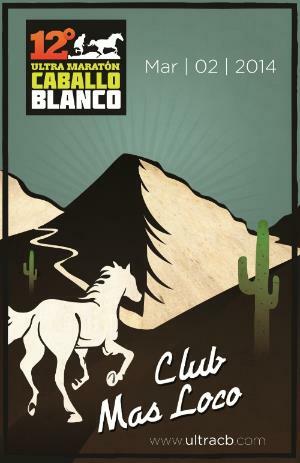 Get yourself one of these cool posters at the Ultra Caballo Blanco 2014! If you want a poster in advance - CLICK HERE - We also have some cool 3"x3" stickers to give out. Greetings Mas Locos and Mas Loco Supporters! From Urique's office of El Presidente, Daniel Silva Figueroa, Director of Tourism, Cecy Villalobos, and Sports Director, Arturo Langarica, we welcome you to the 12th Annual Ultra Caballo Blanco! The spirit of the Sierra Madre, encompasses a spirit of unity, freedom, and hope to everyone.The wind, the trees, the animals, the corn, the beer, our friends, our suffering, our dreams - only these things tell us what is most important. By following the dreams of El Caballo Blanco, everything shows itself through our personal journey in Las Barrancas Del Cobre. Micah's simple vision was to create peace, hope, harmony and love with our Raramuri Brothers and Sisters, to celebrate their running culture, and provide sustainability through nutrition, and education within their communities. We honor the legacy of Micah True, and show the utmost respect of the running traditions of all people. Together, on March 2, 2014, we all run free. We are excited to announce that we have over 70 International Mas Locos registered for our race. Daily, our numbers continue to grow. We anticipate well over 350 Tarahumara runners on Race Day, the largest attendance in history. Saturday morning, on March 1, all Mas Locos, and the families of Las Barrancas will line the streets, cheering on their children as they race throughout Urique, for our second annual, La Corrida de Los Caballitos. (The Kids' Race). Almost as soon as they learn to walk, Raramuri children learn to run. Every child is a winner, receiving customized race shirts, finisher medals, and school supplies. Our children of the future, running free. The race course offers the natural beauty of The Mother Mountains of the West. Although the terrain is rough and broken, the cliff walls of the Sierra Tarahumara are less sheer, the colors so delicate, with the hughes of chilly green, sparkling blue, and sandy brown. The summer and fall seasons have been blessed by the tender, rich tear drops of the Mother Rains. The Sierra Madre is appropriately massive, just as Mother Mountain should be. She gives birth to a new life, not only for her children, in the Canyons, but for others in the foothills and plains below. The pueblos of Urique, Guadalupe Coronado, Mesa Naranja, and Los Alisos, is where paradise meets the sky. With arms wide open, and loving hearts, we welcome you to the magic, the beauty, the peace of Las Barrancas Del Cobre. Viva Mas Locos! Viva Chihuahua! "When the West wind brings the spirit of the Horse into your life, it is to remind you that the Natural Way has not been lost. You wonder why you feel good when you touch us, lean into us, ride us? It is because we connect you to the stars, a mirror from the sun, so you may find your way home, a secret greatness within that seeks expression, a wisdom entwined into the wildness"